The new Ltd. Ed. Elitist “1965” Casino Vintage Outfit is an exquisite hand-made marvel that recreates one of rock and roll’s most legendary instruments. All Epiphone Elitist acoustic and electric guitars are made at our Epiphone factory in Japan that specializes in handmade, highly accurate reissues made with time honored methods and impeccable attention to vintage detail and quality, including period-correct USA pickups and electronics. Epiphone Elitist instruments also feature traditional hand rubbed nitrocellulose color finishes that enhances a guitar’s look over time with gradual shading and fading patterns that are as unique and personal as your own story. Today, Epiphone’s Elitist Series instruments are some of the most sought after by players of all styles, and the Elitist factory in Japan is considered one of the premier instrument factories in the world. And no guitar says “Epiphone” quality and history better than the new Ltd. Ed. Elitist “1965” Casino Vintage Outfit. For over 140 years, Epiphone has made its reputation producing some of the greatest and most innovative musical instruments in popular music. 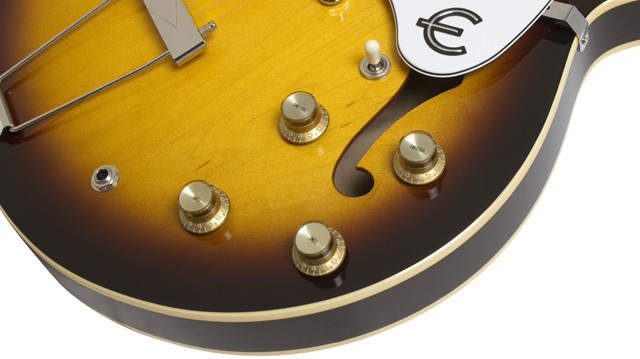 While models such as the Broadway, Wilshire, Coronet, Emperor and Texan are some of Epiphone's most memorable models, the Casino is arguably our most famous due to its close association with The Beatles. The new Ltd. Ed. Elitist “1965” Casino Vintage Outfit is the ultimate Casino featuring the classic look, sound, and features of an off-the-shelf 1965 Casino, the exact same Casino that propelled hits by The Beatles, the Rolling Stones, the Kinks, Paul Weller, Noel Gallagher of Oasis, and modern artists as diverse as Gary Clark, Jr. and Radiohead. Maybe it’s purely coincidental that at the same time the Casino was in its planning stages at Epiphone headquarters in Kalamazoo, Michigan, the Beatles were starting out, too. By 1965, the Beatles were the toast of London and when Paul McCartney went shopping for a new guitar that could give him the overdriven blues sound of artists like Otis Rush, he reached for a Casino. John Lennon and George Harrison soon bought Casinos as well and used them on stage and in the studio at Abbey Road throughout the rest of the band’s career. Carl Wilson of the Beach Boys, Paul Weller of the Jam, and Noel Gallagher of Oasis are just a few of the players who made great records with Casinos. And now with the Ltd. Ed. Elitist “1965” Casino Vintage Outfit, you can, too! As with every Epiphone, the Ltd. Ed. Elitist “1965” Casino Vintage Outfit also comes with the peace of mind of Epiphone’s Limited Lifetime Warranty backed by Gibson Musical Instruments’ famous 24/7/365 day Customer Service. Make your own history today with the Ltd. Ed. Elitist “1965” Casino Vintage Outfit. The Ltd. Ed. Elitist “1965” Casino Vintage Outfit is made exclusively for Epiphone in Japan. 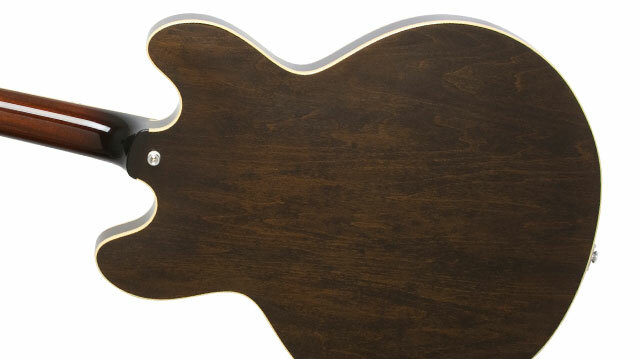 The body features a 3-play laminated Maple top, back, and sides with Spruce bracing. The Casino’s 24.75” scale mahogany neck has a classic 1960s SlimTaper™ “D” profile with a glued-in neck joint that joins the body at the 16th fret, just like original Casinos from the ‘60s. The 12” radius neck features a fingerboard with parallelogram inlays, and a 1.68” exclusive Delrin® nut that replicates vintage bone nuts of the past. The body features a classic Vintage Sunburst Nitrocellulose Lacquer finish with single layer white binding on the body and neck. The body has a white 3-layer pickguard with metal “E” and the sloped dovewing headstock has a period-correct “Epiphone” script in pearloid. Tuning is spot on thanks to vintage style Gotoh® "Deluxe" Machine Heads with a 14:1 tuning ratio. No detail of the original Casino has been missed and like the original Epiphones made in Kalamazoo, Michigan, the new Epiphone Ltd. Ed. Elitist "1965" Casino Vintage Outfit made in Japan incorporate Gibson USA’s famous P-90T and P-90R dogear pickups for that perfect combination of chime and growl. Widely known as the king of single coil pickups, these lean and mean P-90's offer a stellar combination of high output and biting treble response. When they were first introduced in the late 40s and early 50s, P-90 pickups were favored among jazz players for their clear horn-like tone and were later adopted by rock and rollers from the US and the UK who wanted to emulate their favorite R&B records. One of the keys to the Casino’s tone—its chime and ferocious overdrive--is its completely hollow body (with classic music script style f –holes! ), which contributes greatly to its signature sound. 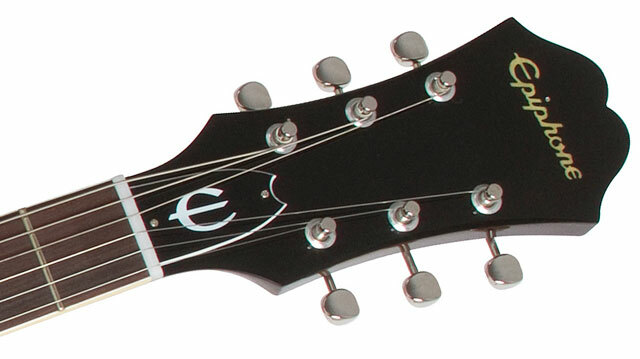 Intonation is easy and reliable thanks to Epiphone’s Tune-o-matic bridge with Delrin® Saddles and trapeze tailpiece. All hardware is nickel and the Switchcraft™ 3-way toggle switch ensures life long security. The Casino’s controls feature CTS® 250K Audio potentiometers, Orange Drop 473 capacitors, and Vintage style gold metal inserts with pointers for each pickup’s volume and tone controls—and all are details you’d find on any vintage 1965 era Casino. The Ltd. Ed. Elitist “1965” Casino Vintage Outfit comes with a beautiful 1960s era hard case.